The first barbecue of the year can be a bit breezy or even a tad damp, but when the flowers bloom and the sunshine breaks out and warms the air we are driven to the back yard for a barbecue. This workshop is just the ticket to get us in the mood. 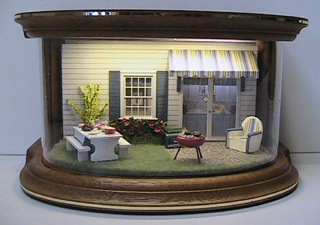 Workshop includes the new wrap around hardwood display case with a stage insert. The case is pre-electrified with 9 volt LED lighting. The stage insert pulls out for ease of decorating. Faux exterior building wall with a door and window to view the inside of the house. Quaint little back yard (freshly mown lawn and flowers) just the right size for a picnic table and benches, a barbecue, ice chest, chair and an awning just in case it drizzles. The table will include two plates with scrumptious hamburgers and chips. 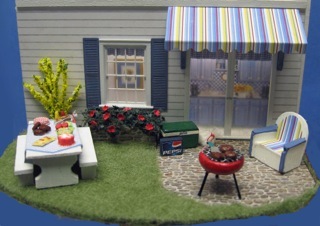 The barbecue will come with hamburgers on the grill.